that girl in the wheelchair: Where's Latvia again? One of my favorite OCD past times is checking the stats page on my blog site. I have made no secret of this self indulgence and have mentioned it numerous times [Exhibit A, Exhibit B]. One of the most interesting statistics is seeing who around the world is reading my blog. I do have friends that live in other countries, but find it odd that those countries aren't even cracking the top 10. Way to go, international friends! What's stranger than the fact that people in Hong Kong understand English and all my pop culture references is that Latvia is in second place for page views, and I wasn't even entirely sure where Latvia fell on the map. [Tangent: I should go ahead and say that Geography is not one of my strong suites. Although I am the proud owner of a passport, I have never left the country. It is also one of the only tests I have ever cheated on in high school...how else was I supposed to know all the countries in Africa and their capitals. There are a damn lot of them, and then there are all those little coastal ones in east Africa. Remembering them is just not feasible for a girl who at the time garnered all her vitamins and daily minerals from a tray of curly fries at lunch.] I felt ignorant and despite that maxim, ignorance is NOT bliss. 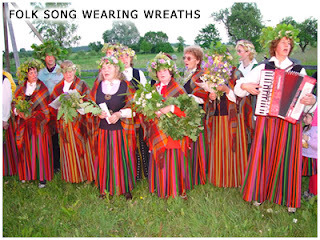 I turned to my guidebook, Wikipedia and learned that all I could about this magical land of Latvia. Latvia was founded November 18, 1918. Kimmie was founded (born) November 18, 1982. By Demographics, 2.86% of Latvia's population is Polish, whereas 50% of Kimmie is Polish. The main religion in Latvia is Roman Catholicism. My main religion until the age of 18 was Roman Catholicism. All these factors should make it crystal clear that if Latvia was a person- I would either be its BFF or hate it completely. My intention is that this blog will further endear me to the fine Latvian people, and they will spread the Kimmie Gospel to all the Baltic countries. Oh wait, they speak "Lettish" there and are likely only finding this site in error and see it as gibberish with bizarre pictures? Dangit. Foiled again. Estonia has clearly not caught on. Which 50% of you is Polish? so ..you are a recovering Catholic. The speak Lettish, thats close to Fetish,...just saying. 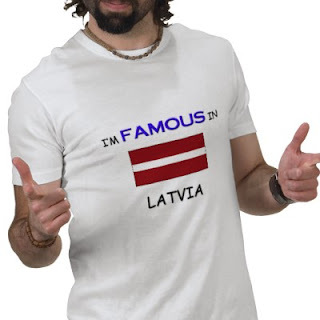 Lettish is an archaic term -- the language we speak is called Latvian.